Start of the new year with a new you! Tired of holding your breath to zip up your pants? Tired of the “muffin top” on your hips? Imagine a better you by treating yourself to CoolSculpting® with Dr. Benjamin Lam at Bucks County Plastic Surgery Center in Newtown. CoolSculpting is a revolutionary body-contouring treatment that precisely targets the stubborn fatty areas you want to lose. Before CoolSculpting, there wasn’t a nonsurgical way to sculpt the body and reduce fatty areas. The truth is: we all have stubborn fat. And, as we age, gravity and genetics seem to make matters worse. Proper diet and exercise alone are not enough to keep these stubborn areas at bay. 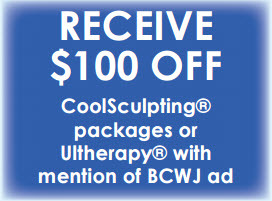 CoolSculpting is a solution for getting back the body you want, without surgery or downtime. CoolSculpting is FDA approved, so you can be confident of safety and effectiveness. The procedure involves isolating and freezing stubborn fat, which is then naturally eliminated from your body. In the weeks and months following treatment, the treated areas are reduced. No surgery, no downtime, no medications! Dr. Lam and his treatment specialist Stephanie DiSante will develop a customized “treatment to transformation” plan to address your concerns. This comprehensive approach may involve multiple one-hour treatments and is designed to optimize your specific results. If you answer YES to any of these questions, CoolSculpting is for you! Have pudgy areas resistant to diet and exercise? Say good-bye! Are you too busy for recovery and downtime? None with CoolSculpting! Do you prefer the option and privacy to drive yourself to and from a treatment? 100% confidential and independent! Do you want to avoid hospitals, needles, anesthesia, and medicines? None with CoolSculpting! Can you be patient for several weeks (4-12) while frozen fat cells are being eliminated? Want your “treat to transformation” plan? Call 215-702-8600 to schedule a complimentary consultation with Dr. Benjamin Lam and Stephanie today! We look forward to making “imagine a better you” happen! Visit the Bucks County Women’s Journal for more great articles.